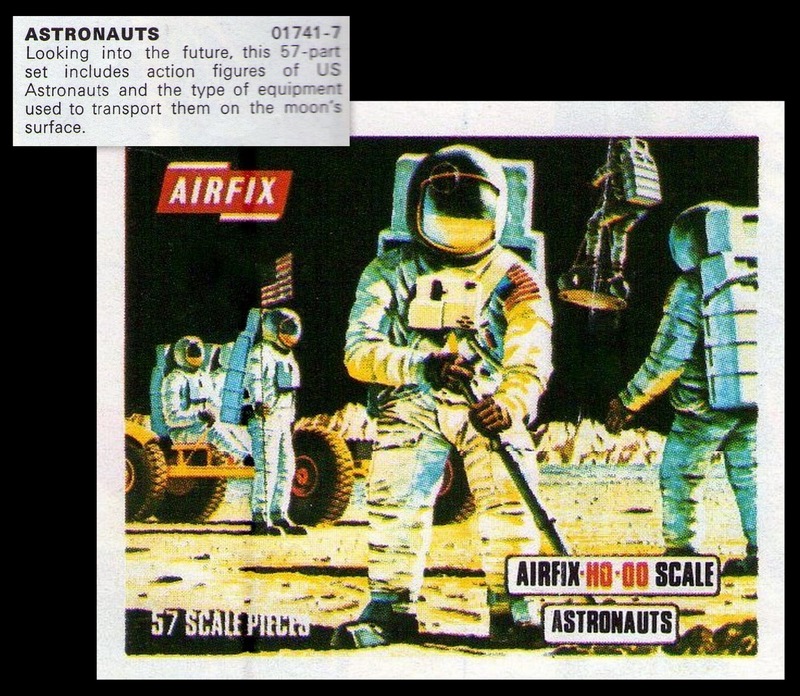 One of the only Airfix sets which had no counterpart sets or 'enemy'. By going down the NASA route and using non-warlike designs based on actual or planned equipment from the real-world Airfix lost the possibility of adding vicious space-alien sets and expanding the range exponentially, had they done so, we might never have heard of Games Workshop and White Dwarf might have remained the interesting and eclectic magazine it was for its first few issues!! Instead, GW became the 'Evil Empire' even as Airfix folded. 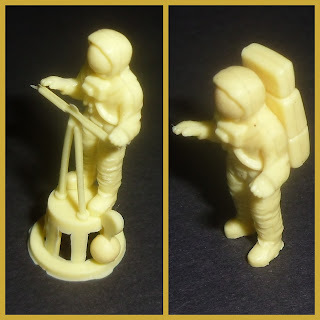 However, it was still a great favourite at the time, men had walked on the moon the year before this set was issued, and with all the little plug-together accessories there was play-value, the cameraman clearly had a ray-gun, the bloke carrying stuff was obviously carrying charges - nuclear charges!! The chap with the probe was undoubtedly doing something horrible to the dustbin-lid entries on the Clanger's underground complex while the hover-platform men carried two para-munitions either side of the platform...what? You actually played 'NASA' exploration?...There's some'in wrong wi'yer! 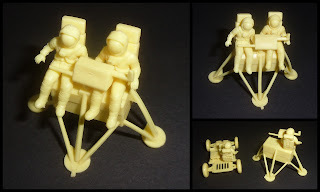 The moon-buggy, a lovely piece, not that accurate but there were so many pre-production prototypes it would have been hard for the Airfix pattern-makers to get it right, without the limitations of production methods and budget to boot. Word of warning to collectors - Like the Waterloo French Artillery wheels, these are now very hard to remove without pulling the mounting spigot/axle off and ruining the thing for all time, so its best to either keep them on or use a tooth-pick or other soft'ish, blunt'ish thin-thing to push the spigot/rod through the wheel, rather than pulling on the wheel itself. The 'hover platform', not something that actually saw service, but like assault infantry backpacks; something that was experimented with from the 1950's through to the 70's! But...clearly a powerful weapon system for engaging the Giant space aliens or the evil - scaling-out to - 7-foot-something LP/Triang humanoids!! The rear view also shows the (power cable?) 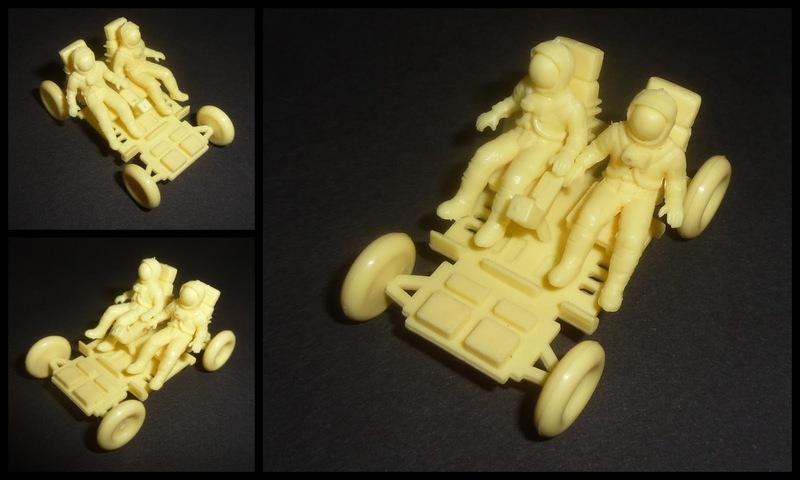 difference in back-packs for the moon-buggy crew, these push into the floor-pan of the buggy to aid stability, all the other figures get a normal pack. Artwork from late catalogues, these seem to be the illustrations from the Long Boxes and look to be very nice watercolours when enlarged. The 1982 image is from the German language version of the catalogue. For those interested - the font I've used for the dates is a free download called TR2N (ie; TRON) and can be found here Dafont - TR2N. OBE's - Once more; I don't have many of these, but they give an idea of the two camps...NASA realists against militarised warmongers (Me sir! Me!). I think a couple of them have the Space 1999 schemes? 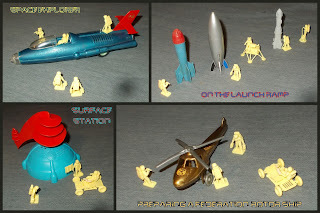 And...more Airfix matt vermilion! (see; High Chaparral). 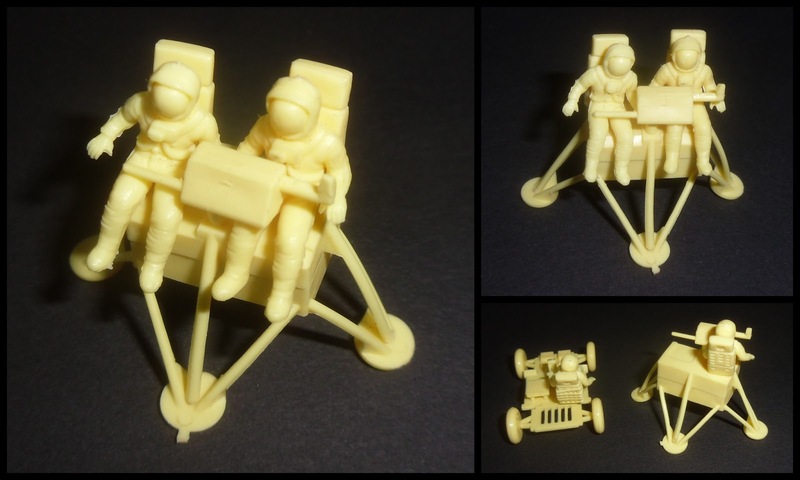 Re-issued a few years ago in a silver plastic, that's the only real variant for these, there were two hard styrene plastic ones in the Eagle-Lander Module kit which I will add here when time allows. We've found a monolith on the dark side sir! Is it a big oblong box-like structure made of something too hard to penetrate and unknown to man, emanating the cry of the universal God-child? No sir, it's hollow and has Bon-bon Buddies on the underside! The breakdown of a complete set, the little balls (gyroscopic levellers? They should have had Segways!) for the hover platform are 'the bugger' with this set, being often overlooked at the de-sprueing phase, or easily lost. Thanks to Greek follower of the blog Kostas, we have this collage of the box-art and blurb from the 1975 catalogue, the rover here has much larger rubber-tyred wheels than the contents of the box, and seems to have a raised battery on the front deck, the actual one had sort of tension/compression-stressed wire-basket wheels. 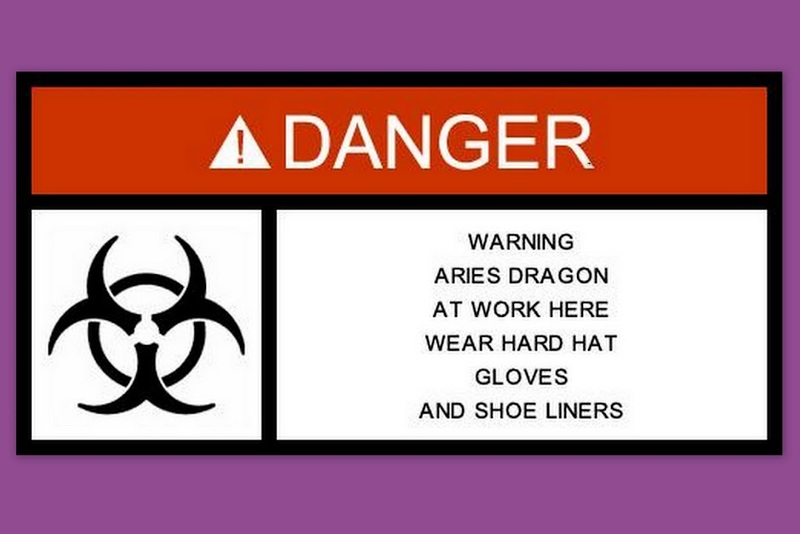 We've looked at these over on the other blog, and they appeared on Moonbase, but they need to be here too! Montaplex; from the vehicle range, they came with a sea-plane/float-plane and a 54mm scaled moped/scooter. The astronaut is larger, while the alien (?) crew of the saucer are much smaller. 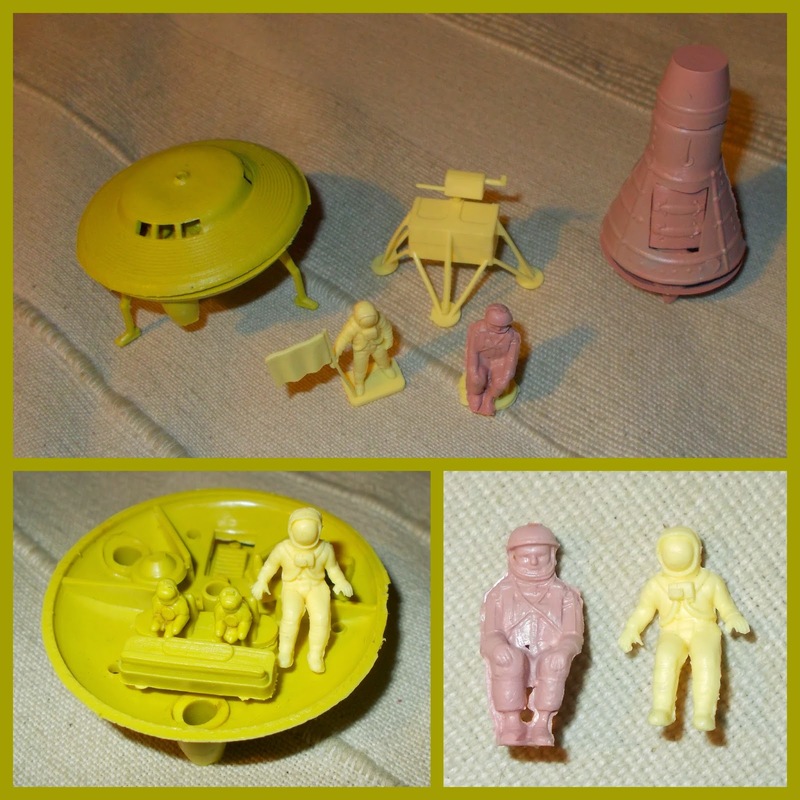 Montaplex also produced a set of vaguely HO scale spacemen (or Aliens, the detail is poor!) 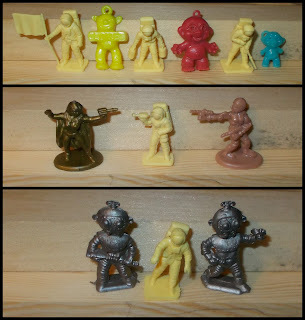 which included an odd-looking rubber-boat like transporter with seated figures and these small chaps and chapesses. I tend to think they are the children of an Earth colony, helping/learning how to wreak another planet! Comparisons with other makes/brands: the top shot is of vuagly 25mm vinyl monster aliens, somewhere - in styling - between Games Workshop's Tyranids and Bluebird Havok's Pteravore, anyone know who/what/where on them? 2nd shot down is the Jean astronauts, sort of the right era clothing, but definitely the wrong size! 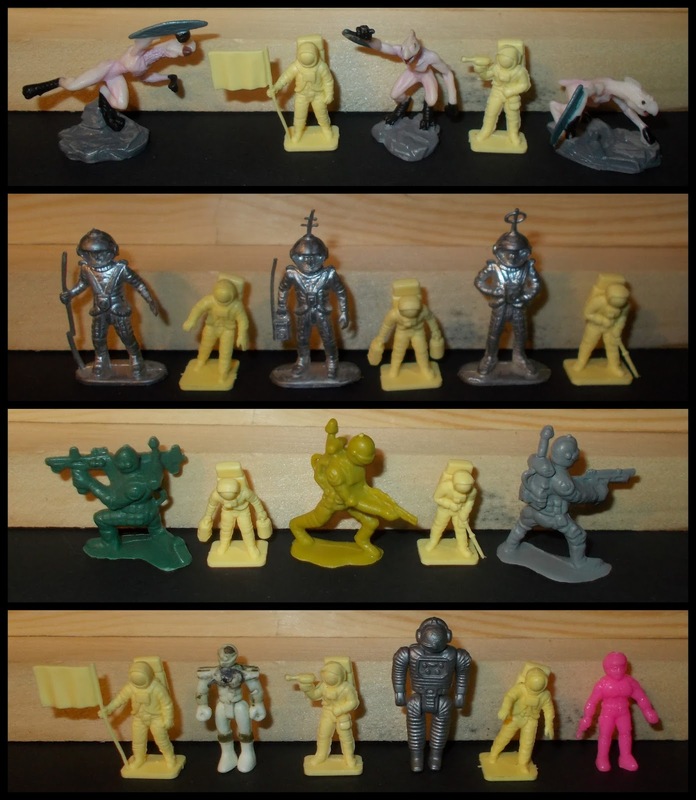 3rd lot are generic rack-toy scale-ups of the Galoob Expanders line, again too big, but what's scale when you're dealing with giant alien attack-fleet marines from the low-grav sector three rim-worlds? 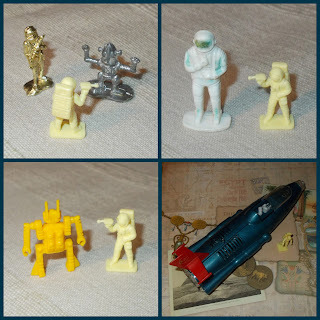 More comparisons; LP spaceman and robot top-left, then clockwise; unknown (but known somewhere in the files) astronaut, gum-ball robots and the X-30..."You can take the helmet off mate, dog's fine!" Top, gum-ball trolls (sans hair), middle the TSR Buck Rogers Battle for the 25th Century board-game pieces and at the bottom the Galanites from Coma...waaaay too big really! 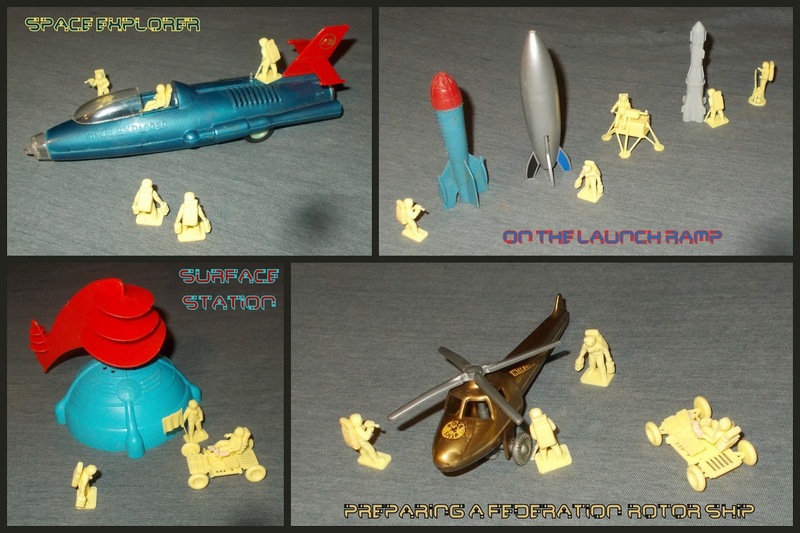 Bits of a Payton spaceman's 'Missile Helmet' make the surface station, various other space toys arranged to give the Airfix chaps (who are otherwise a bit boring!) something to do! 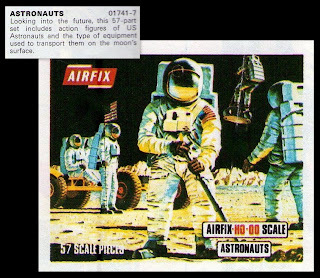 FYI, the Spanish toy producer MONTAPLEX sold, in the '70, a copy of the Airfix 1/72 astronauts (even not of the veichles...), in soft with plastic. I have got them (and the horrible washed-out grey ones from BuM), just haven't got round to getting them up here yet! Also there are real similarities with the new Caesar set, so will get them here too eventually! 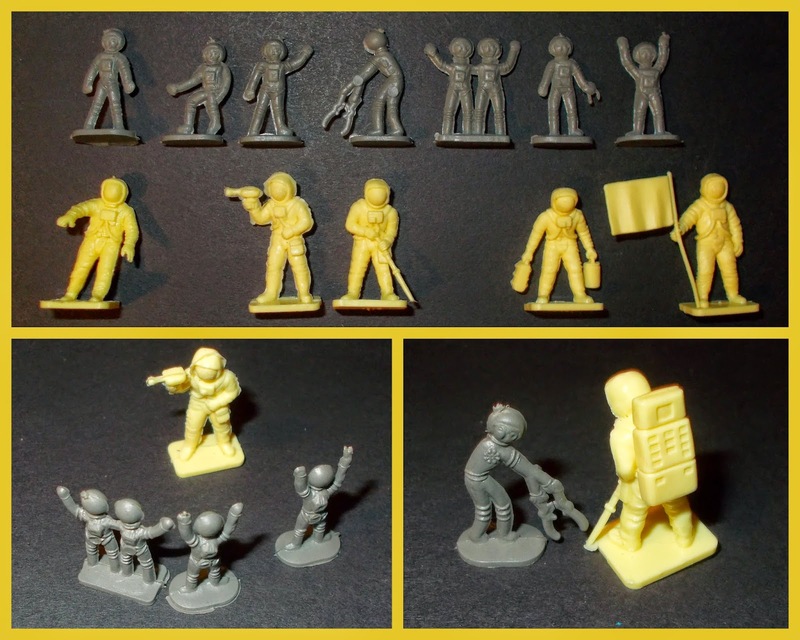 This blog is very much on the back burner at the moment, I haven't done much on it for a while, but the interest in Airfix isn't what it used to be! "The 'Lander'...no...I haven't the faintest idea...I'm hoping one of the boys from Moonbase Central will visit here and put me right on this one!!" It was always my favorite piece in the set when I was a kid! JFBen....what a Star you are! I knew someone would know, and it was thee...thank you very much, I'm off to Google it!